The Section 21 Notice is valid only when issued in writing, giving at least 2 months’ notice. Additional clauses apply if you have been a periodic tenant, the notice must end on the last day of your tenancy, this is generally the day before the rent is due, and also state that it’s being issued under Section 21 of the Housing Act 1988. Should you fail to leave when this notice expires, the Landlord will have to make an order to the court for a Possession Order. The Online possession form will cost £325, which is cheaper than actually serving it in your local county court. The Landlord needs to weigh up the costs as there’s no guarantee that, these costs can be recovered from the tenant. You paid a tenancy deposit and the Landlord failed to register the deposit in a protected government approved tenancy deposit scheme. The Landlord failed to provide the tenant with the prescribed information in relation to the chosen tenancy deposit scheme. The original deposit was protected but not re-protected when the tenancy becomes periodic. You reside in a HMO (House of Multiple Occupation) that should be licenced by the Local council authority, but is not. In general Bedsits, Bed and Breakfast accommodation are classed as HMO’s. The Section 21 Notice is also invalid if a new fixed term tenancy agreement is issued after the notice is issued. 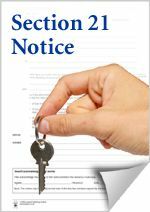 A Section 21 Notice cannot be issued in Retaliatory Eviction. This is where a tenant informs the Landlord of a repair, that needs carrying out and the Landlord serves notice in response to this. The Landlord cannot issue the Section 21 unless the following process has been adhered to. This is for the tenant to submit in writing a complaint, the landlord, in turn has 14 days to respond to this letter, should he fail to do so, the tenant should report his concerns to the local authority. The local authority can either carry out remedial works under the powers of the HHSRS, or serve the Landlord with an improvement notice. A Section 21 Notice is not able to be served for 6 months following a Local Authority Improvement Notice. Should the Landlord have grounds to evict you, he can do so, using a Section 8, however he must be able to prove the grounds cited in the notice. A Section 21 Notice must be issued prior to applying to the court for a possession order. Possession under this section of the housing act cannot take place during the fixed term of the tenancy. For all tenancies issued after 1st October 2015 a valid Section 21 can only legally be issued after the tenant has been supplied with a valid Gas Safe Certificate and a valid Electrical Safety Certificate. Copies of all updated certificates during the term of an ongoing tenancy, must at all times be supplied to the tenant. Should you have a six month tenancy term, a section 21 notice cannot be served. Notice periods will expire a few days after the end of the tenancy term. Should the tenant vacate the property within this time, the Deregulation Act stipulates that, a Landlord should repay any overpaid rent, as the tenant is only liable for the first few days that they remain resident in the property. The Landlord can apply to the court for a possession order after any of the above Section 21 notices have been served and expired. Should the tenant fail to leave once the possession order is granted, the Landlord will have to go back to court to get a Bailiff warrant for removal of the tenants. The courts can instruct Bailiff’s to execute a warrant on the property which will be at the Landlord’s cost. To start a possession claim online it’s very easy. You may be able to get legal advice from a solicitor if you feel that you are unable to fill out the form yourself. If there is any information that you do not understand in regards to a possession order, please contact a legal representative or use either Shelter or the Citizens Advice Bureau.